2.2019 Congratulations to Rahman and Jonathan, whose paper on Suzuki cross-coupling of N-acyl-phthalimids is published in a Special Issue on Suzuki Cross-Coupling! (Catalysts). The paper is available open access. 1.2019 Special Issue on Amide Bond Activation is published! All papers are available open access. 1.2019 Our review on twisted amides is published in Amide Bond Special Issue in Molecules! The paper is available open access. 1.2019 Congratulations to Jonathan, whose review on acyl Suzuki cross-coupling is published! (Catalysts) The paper is available open access. 12.2018 Meng’s paper on determining sigma-donation of NHCs is published! (Tetrahedron Lett.) Congratulations to all involved! 12.2018 Congratulations to Jin, whose paper on aminocarbonylative amide synthesis is published in J. Org. Chem.! 11.2018 Congratulations to Jonathan, whose paper on Suzuki cross-coupling of pfp esters is published in Amide Bond Special Issue in Molecules! The paper is available open access. 11.2018 Chengwei’s paper on direct borylation of carboxylic acids is published in Angew. Chem.! Congratulations to all involved! 11.2018 Congratulations to Meng, whose paper on B-alkyl Suzuki of amides is published in Org. Lett.! 11.2018 Congratulations to Ola, whose paper on structures on amides is published in Acta Cryst. C! 10.2018 Congratulations to Guangchen, whose paper on metal-free transamidation is published in Nature Commun.! Well-done! The paper is available open access. 09.2018 Congratulations to Cheng, whose review on Pd-NHC precatalysts is published in Acc. Chem. Res.! Congratulations to all involved! 07.2018 Final project from a graduate class CHEM 575 class gets published! Congratulations to Xu, whose review on C-O activation is accepted to Org. Chem. Front.! 05.2018 Congratulations to Meng, whose review is selected as a Cover Profile in the 20th Anniversary Issue of Eur. J. Org. Chem. Well-done! 02.2018 Congratulations to Meng, whose review on N-acyl-glutarimides is published in the 20th anniversary issue of Eur. J. Org. Chem., and selected as a Hot Topic: C-C Coupling. Well-done! 11.2017 Cheng’s review on SmI2 cross-coupling in synthesis of N-heterocycles is published. Well-done! (Molecules) Free full-text available! 10.2017 Our papers are highlighted in Synfacts and on Organic Chemistry Portal. Congratulations to Cheng and Meng! Chengwei’s paper is selected as a Hot paper in Angewandte. Well-done! 09.2017 Elwira’s paper is selected as the Front Cover and highlighted as a Cover Profile of ChemSusChem. Congratulations! This is our third Cover this year! 08.2017 Congratulations to Cheng, whose paper has been highlighted on the front cover of Synthesis, Special topic on Nickel catalysis. Well-done! 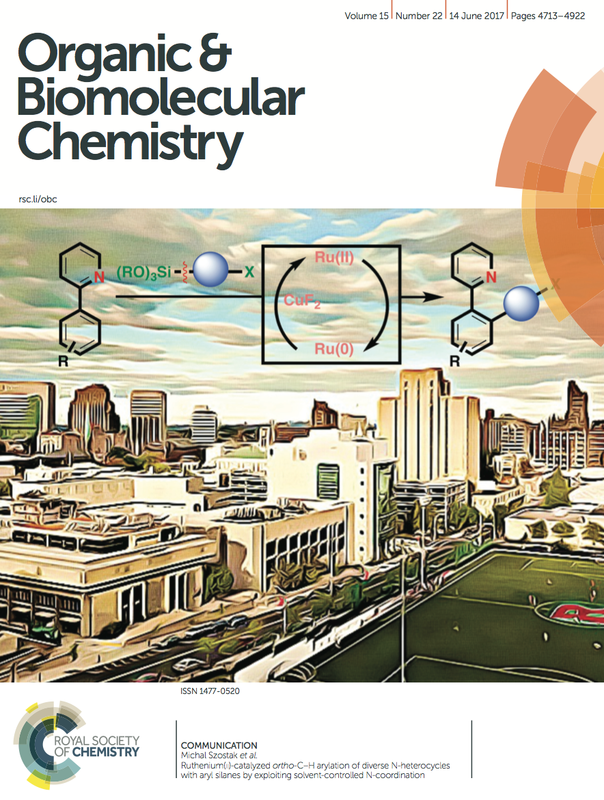 06.2017 Congratulations to Pradeep, whose Ru(II)-paper has been highlighted on the front cover of Organic & Biomolecular Chemistry. Well-done! 05.2017 Congratulations to Chengwei (Organic Letters) and Pradeep (Chemical Science), whose papers have been highlighted in Synfacts. Well-done! 04.2017 Congratulations to Chengwei and Marcel, whose paper on N-acylazetidines has been highlighted at Organic Chemistry Portal. Well-done! 03.2017 Our metal-free transamidation paper has been highlighted at In the Pipeline. Well-done! 03.2017 Our amide Suzuki biaryl synthesis paper has been highlighted in The Celebration of Scholarship 2017. Well-done! 02.2017 Meng’s and Cheng’s papers on the Suzuki-Miyaura and Negishi cross-couplings of primary amides are highlighted in Synfacts. Well-done! 11.2016 Cheng’s paper on SmI2-H2O-mediated cyclizations of aminoketyl radicals is highlighted in Synfacts. Well-done! 11.2016 Chengwei’s paper on Suzuki-Miyaura cross-coupling of N-acylsaccharins is highlighted in Synfacts and Organic Process Research & Development. Well-done! 07.2016 Pradeep’s paper on the ruthenium(II)-catalyzed C-H activation is one of the most accessed articles in ACS Catalysis. Well-done! Group News: See our Publications page for what we’ve been up to recently.